January 8th, 2010 Dress up brute force real pretty and put lipstick on it. The second [ http://www.wired.com/dangerroom/2010...s-online-life/ ] notes a declassified intelligence report today on Detroit terror suspect Umar Farouk Abdulmutallab, a.k.a. the Underwear Bomber, and involves a look at Abdulmutallab�s online life � and possibly, his increasing radicalization. Following his use of the online handle �Farouk1986,� Abdulmutallab was a regular on the Islamic forum Gawaher.com, where he appears to have posted 310 times between 2005 and 2007. Thanks to the Evan Kohlmann of the NEFA Foundation, we now have all of Farouk1986�s posts, assembled into a single file. The CLS Blog took this one step further, generating a basic visualization and analysis of the structure of Farouk1986�s online communication network as it evolved over time. Personally, it sounds to me like these folks have too much time on their hands and that they need to stay home more often to help with the laundry and the child care. In the dark, in the silence, in a blink, the age of the autonomous killer robot has arrived. It is happening. They are deployed. And - at their current rate of acceleration - they will become the dominant method of war for rich countries in the 21st century. These facts sound, at first, preposterous. The idea of machines that are designed to whirr out into the world and make their own decisions to kill is an old sci-fi fantasy: picture a mechanical Arnold Schwarzenegger blasting a truck and muttering: "Hasta la vista, baby." But we live in a world of such whooshing technological transformation that the concept has leaped in just five years from the cinema screen to the battlefield - with barely anyone back home noticing. This is "one of the most fundamental changes in the history of human warfare," according to PW Singer, a former analyst for the Pentagon and the CIA, in his must-read book, Wired For War: The Robotics Revolution and Defence in the Twenty-First Century. Humans have been developing weapons that enabled us to kill at ever-greater distances and in ever-greater numbers for millennia, from the longbow to the cannon to the machine-gun to the nuclear bomb. But these robots mark a different stage. Johann Hari is a columnist for the London Independent. He has reported from Iraq, Israel/Palestine, the Congo, the Central African Republic, Venezuela, Peru and the US, and his journalism has appeared in publications all over the world. On the U.S.-Mexico border, the American government has been trying, with limited success, to set up a string of sensor-laden sentry towers, which would watch out for illicit incursions. In Israel, they�ve got their own set of border towers. But the Sabras� model comes with automatic guns, operated from afar. The Sentry Tech towers are basically remote weapons stations, stuck on stop of silos. 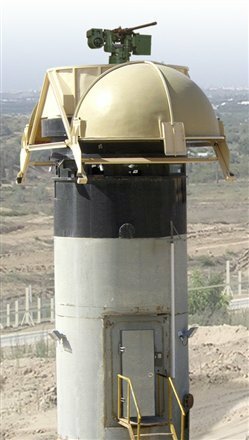 "As suspected hostile targets are detected and within range of Sentry-Tech positions, the weapons are slewing toward the designated target," David Eshel describes over at Ares. "As multiple stations can be operated by a single operator, one or more units can be used to engage the target, following identification and verification by the commander." We flagged the towers last year, as the Israeli Defense Forces were setting up the systems, designed to create 1500-meter deep "automated kill zones" along the Gaza border.